We help people work better and grow together faster. 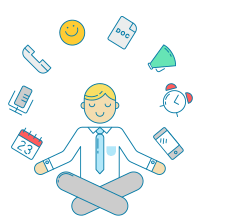 Do more in less time with Hubgets team mood boosters. Build your dream. Let Hubgets help - free for teams of up to 20 members. No more annoying notifications and bots. 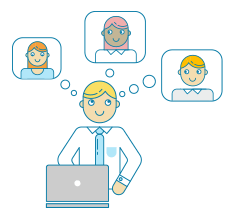 Easily access and contribute to the team knowledge base. 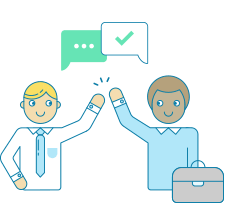 Check out 10 ways in which Hubgets can help your team work better. Hubgets connects goals, dreams, and emotions. 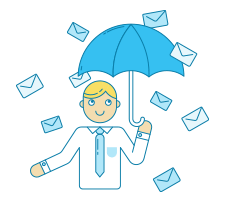 Instant communication frees you from clutter, noise, and spam. 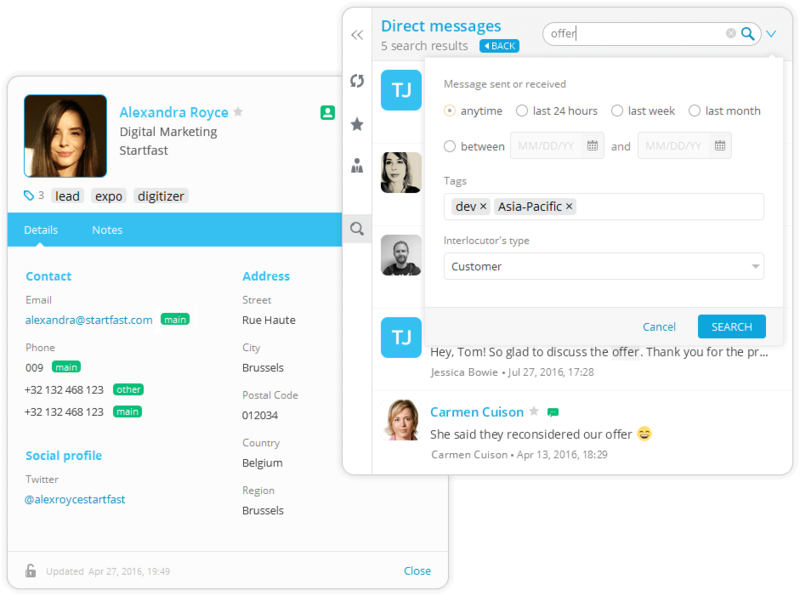 Why wait for an email reply for hours, when you can talk to colleagues and partners in real-time, sharing files, media and reactions? Meetings are great when they're short and produce actionable results. This is exactly what Hubgets helps you achieve with built-in transparency. Say good-bye to heads-up meetings! Dedicate this precious time to more rewarding activities. Why wait when you don't have to? We believe in fast access to communication and information on all team levels. 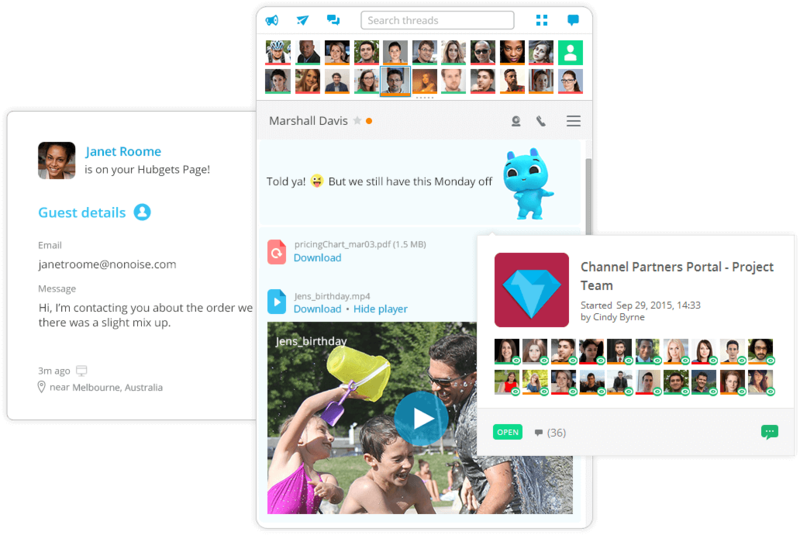 Communication channels like chat, voice, and video are easily accessible and teams are free to organize their resources. It takes more than software to build a great team. The environment is important, and we try to make it special from the very first day new members join the team. The transparency helps building a culture of responsibility and accountability. The human brain is designed to take out the old and make room for the new. This often makes valuable business experience get lost along the way. 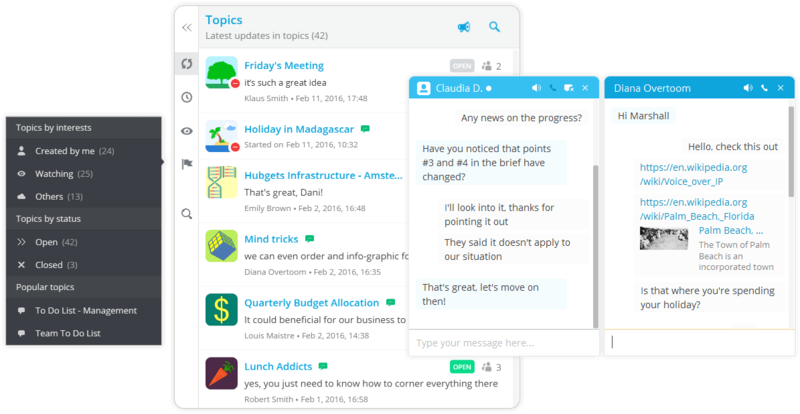 Hubgets indexes and organizes team communication so you can easily find it and use it whenever needed. Great customer experience starts with people. 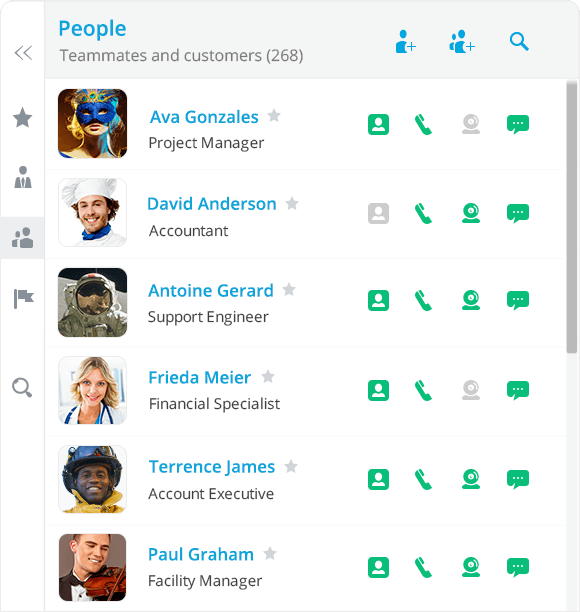 Hubgets focuses on your team, helping your team members connect with business partners. It's a different approach to customer service because everyone is involved. 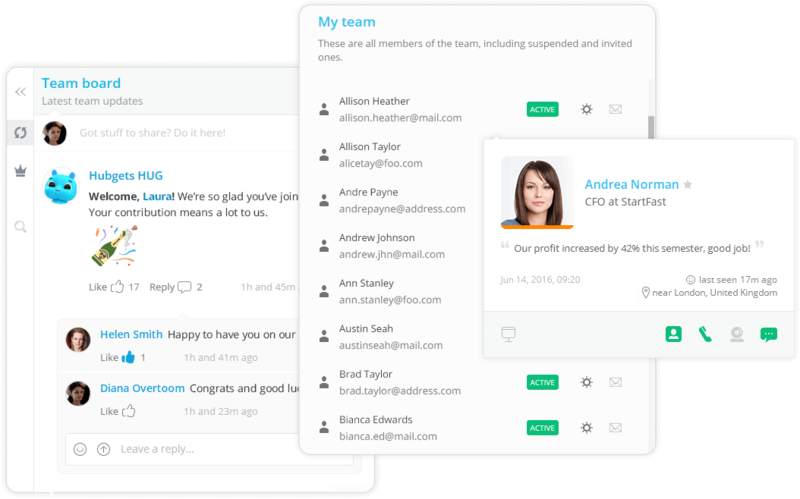 Hubgets makes it ideal for our team to communicate wherever we are. Especially for those working at home or who are on the road. The communication is always up2date and 100% transparent! When you're running a successful e-commerce business, speed is essential. Fast and efficient communication between various teams like Customer Service, IT and Logistics makes all the difference to having satisfied customers. Hubgets helped us converge our business communication and collaboration, which finally translated into better business. 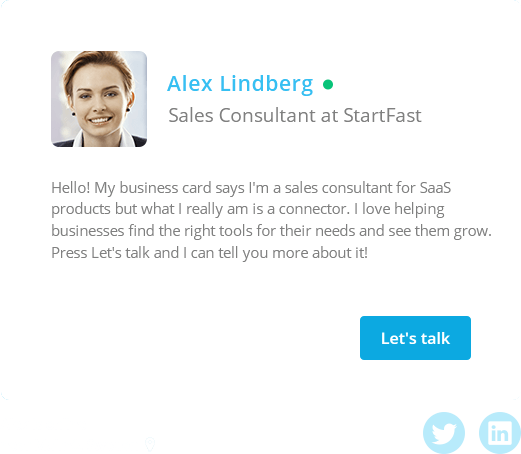 Also, our team members are instantly reachable on their Hubgets Pages, and that enables us to offer our partners a great experience. We were among the very few who had early access to Hubgets. We got to see it has evolved from iteration to iteration, considering this tool was something we really wanted our own customers to benefit from. 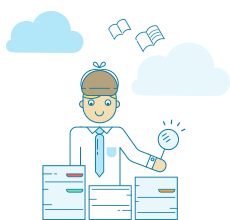 Hubgets offers that information traceability that no other communication tool does. 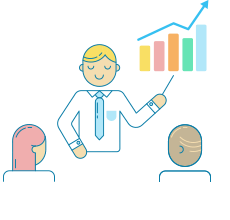 You can find everything so easily that it simply offers the business owner that peace of mind needed to focus on strategy, while the team communicates and collaborates efficiently. Our traditional method of sending out communication was email, but we also worked with our own ticketing system, which basically means that we were using multiple channels to communicate with each other. Some messages or emails were completely forgotten or overlooked. When we started using Hubgets, we were surprised at how much time we saved and how much more productive we became. It's not only that it is efficient; it is also aligned with our business goals. Hubgets makes our communication process complete! 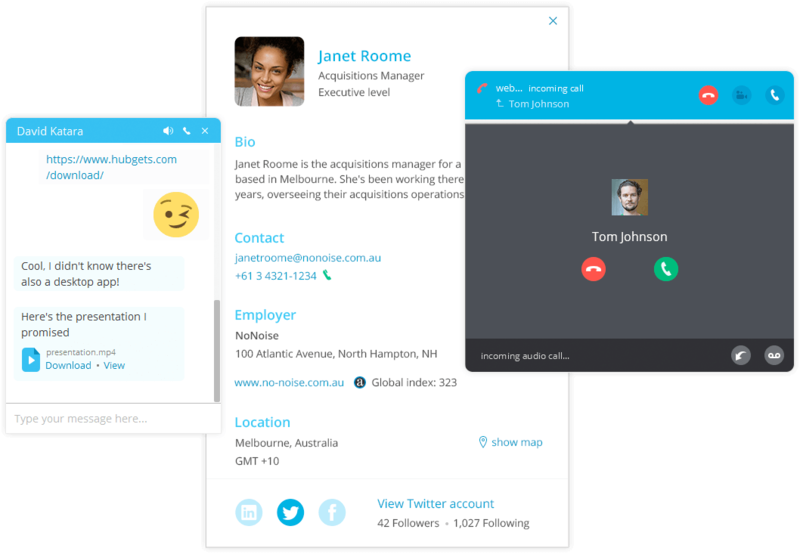 I found that one of the most important parts of managing any team is collaboration, and with Hubgets we've been super satisfied enjoying all the latest features that come along with a real cloud-based Unified Communications system. You never have enough time. We know how that feels. Instant communication is our time hack. Try it. We are here to help you fulfill your goals. © Copyrights 2016 Hubgets, Inc.